It’s that time of year as the kids head back to school and team sports for all of us become a part of our weeks. That’s why September is Sports Eye Safety Awareness Month. Eye injuries from any sport may include infection, corneal abrasions, fracture of the eye socket, swollen or detached retinas or a traumatic cataract. According to recent annual data from Prevent Blindness, more eye injuries occur from water and pool activities than any other sport. Basketball is the second highest cause of sports-related eye injury. Basketball is followed by the use of guns (air, gas, spring and BB), darts, arrows and slingshots, and baseball/softball. Understand that most sports-related eye injuries are preventable. 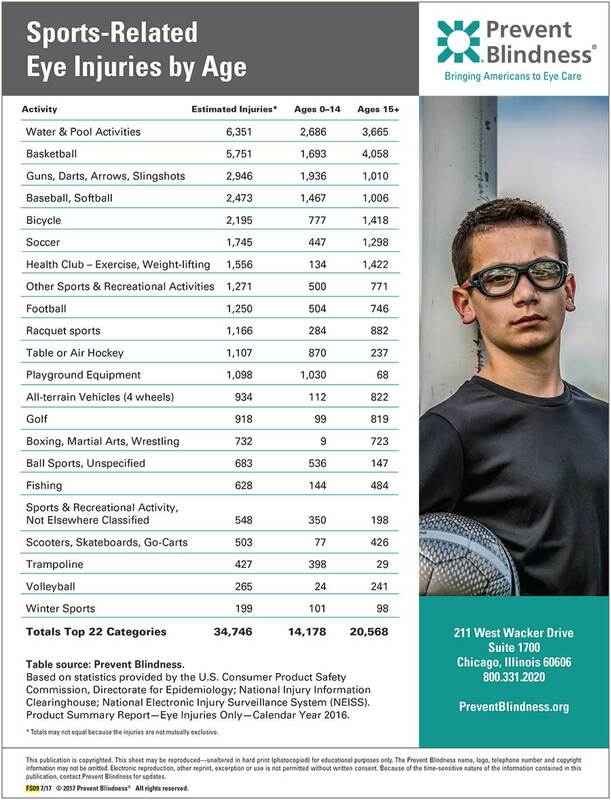 Whatever the sport or the child’s age, appropriate protective eyewear is the best defense against eye injury. Learn about the eye injury risks associated with sports before allowing children to participate. Parents should consult an eye doctor for protective eyewear recommendations before enrolling a child in any sports program. Parents should enroll children in organized sports through school districts, community centers, park districts, recreation centers or licensed facilities where adults supervise all sports activity. Ideally, an adult trained in the prevention, recognition and immediate care of an eye injury should be present at all times. Parents should meet with a child’s coach or athletic trainer to make sure that proper procedures are in place to deal with a child’s eye injury should one occur. Parents, teachers, school nurses and coaches should familiarize themselves with the warning signs of an eye injury and know when to seek treatment. See us for eye protection and if you sustain an injury, let our doctors examine your eyes as soon as possible.